As your child progresses through youth sports, he or she will inevitably change—both in skill level and interest. Most likely, one sport will emerge as the favorite, while others, although enjoyable, will fill a different secondary role. In some situations, parents or coaches strongly push a child to concentrate on a single sport at an early age. More talented athletes are identified early and funneled into lessons and competitive leagues that dominate their young athletic lives. The idea of course is to quickly develop advanced skills and maximize the young athlete’s potential. This approach is often taken by parents who see their children as potential prodigies in individual sports such as tennis or gymnastics. 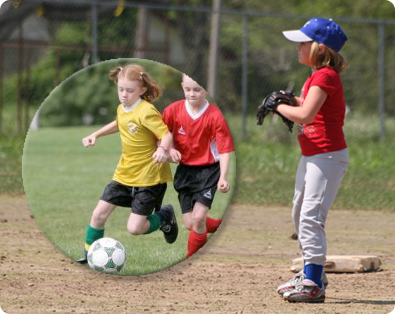 In competitive youth team sports, Amateur Athletic Union (AAU) and club teams often pull a child into a single sport mode. Unfortunately, there are several risks associated with pursuing specialization at too early of an age. Let's take a look at some of these risks, and more importantly, the benefits provided to your child when he or she participates in multiple sports. As your child develops specific advanced skills (while specializing in a single sport), he or she may miss out on the crossover benefits that are generated by playing additional sports. Each sport has its own set of skills and effect on an athlete’s body--and sometimes these provide an athlete with an advantage in another sport. For example, an athlete’s improved movement and footwork gained by playing tennis may translate into an unexpected advantage when the athlete plays soccer. Strategic and tactical skills often cross over from one sport to another, and may help an athlete take a more creative approach within their primary sport. Likewise, hand-eye coordination translates from one sport to another. Playing several sports also safeguards the health of your child. Participating in different physical activities helps avoid overuse and excessive strain on particular muscles and joints. Other sports require the use of different muscles and movements. These attributes can complement the ones used in your child’s primary sport, providing a better-rounded and balanced physical capability that will lead to improved performance. For example, a child who participates in a summer youth swimming program may become stronger and find that this added strength benefits their performance in basketball. In addition to the crossover skill and physical benefits, participating in other sports can provide a more relaxed form of competitive fun. This, in turn, can prevent your child from burning out in their primary sport. These secondary sports can also result in great sports experiences that create memorable, satisfying moments. Although I played three years of varsity tennis in high school, tennis was less important to me than basketball. Nevertheless, tennis provided me with several memorable moments, both good and bad. One of the most satisfying “comebacks” of my personal sports life occurred in a sectional first-doubles match. Down a set to a talented (and arrogant) doubles team, my partner and I gathered ourselves and went on to take the match from our surprised and frustrated opponents. Baseball also played a similar role. Having been the worst player on my freshman team, I learned how to throw a knuckle curve from one of our pitchers. In Pony League play that summer I was an all-star pitcher (and twice beat a team comprised of many of the freshman team's players. Although I only played one more year of summer baseball before focusing on basketball, that experience is one that I fondly remember. And I'm not alone. I've talked with several former players I've coached. Every one of them remembers those special moments in youth sports. Your child doesn't have to play multiple organized sports! He or she can play pickup games in many team sports. Make sure your child has the time to engage in self-directed play. If you schedule every minute of your child's sports life, you remove your child's opportunity to enjoy the many benefits that pickup games provide. Involve your child in multiple sports when they are young. As they age and their focus tightens, continue to encourage participation in multiple sports for both the crossover and enjoyment benefits. At a smaller high school, your child may enjoy the opportunity to play in multiple varsity sports. Remember also that some sports such as golf and tennis can be played through adulthood and into one’s senior years.